MainAll NewsInside IsraelMK Danon in Homesh: Fire Barak! MK Danon in Homesh: Fire Barak! MK Danny Danon attended a rally in Homesh; called on the Prime Minister to rebuild the town - and to dismiss Defense Minister Ehud Barak. MK Danny Danon (Likud) spoke to Arutz Sheva while attending a rally at Homesh this week at the head of a delegation from the World Likud. "Today, we are thousands of people from the Likud movement from all over the world, in Homesh," Danon told Arutz Sheva. We are here "to tell the Prime Minister to get back to Homesh, to let Jews live here in Homesh, to erase the disgraceful decision that pulled Jews out from Homesh," he explained. "I am also calling on the Prime Minister to take a brave decision to remove Defense Minister Ehud Barak from his position," Danon said, repeating his charge that Barak is using his position to undermine the government for his own electoral ends. Barak's Independence faction, which broke away from the left-wing Labor party, has not been polling well enough to be seated should elections be held today. "It is about time that there will be a Defense Minister who follows the guidelines of the government, the guidelines of the coalition..." Danon said, adding that Barak "is fighting against the communities in Judea and Samaria instead of supporting them." "You saw what happened in Hevron," he said, referring to the eviction of 15 Jewish families from Beit HaMachpela (House of the Patriarchs) despite the government's position that the eviction should be delayed until after the Passover holiday so that the legal facts of the case could be established. 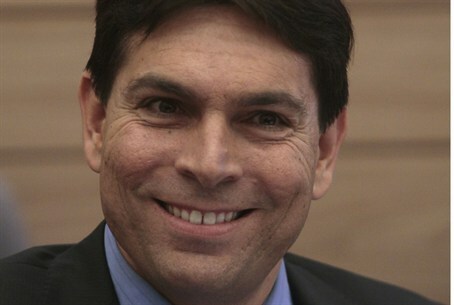 "It is about time to nominate a defense minister from the Likud," Danon said. Normally, Israel’s ruling party appoints the heads of the powerful Defense and Finance Ministries from their own ranks.